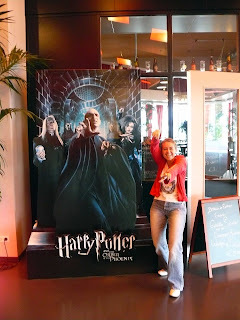 This afternoon Zander, his friend Manuel and I went to the latest Harry Potter movie in Groningen. 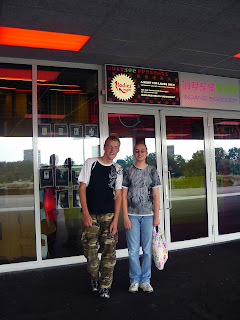 We went to a very large cinema at Euroborg (a new soccer stadium) with also a cinema, casino and a large foodstore: Jumbo. 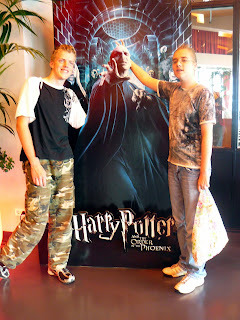 There were only 5 people to watch the movie: we and a mother with a boy of the age of my son. I have never been to a cinema with that small amount of people. I think it was great and very relaxing. 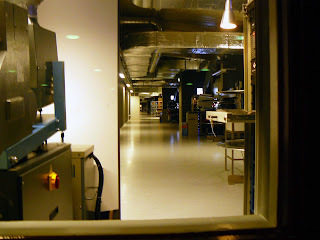 I took a photo of the room where all the projectors for the movies are. It was fun to see behind the scene. The film was great but not as exciting as we had expected. After the cinema we went to McDonalds. Because it was very busy and noisy inside we took our food back to the car and ate it on the parkingplace. My son doesn't like crowded places. I think it's because of his autism. He always gets excited and is hard to handle when there is a lot of noise around him. That's why I was also so glad that there were so few people in the cinema. And to tell you the truth ... I also don't like crowded and noisy places and have the tendency to avoid them. Anyways it was a fun afternoon! Only a few days to go and they have to return to school! They both said that they weren't looking forward to going back to school!